Landlords insurance, please check do you have this in place? This is a rented property we manage in Cheadle. “Storm Doris” hit today 23.02.2017 and blew down the back garden wall. Hard to believe this could happen ! 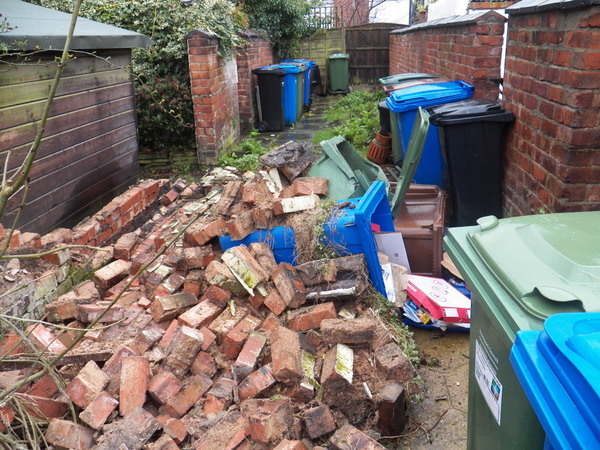 this squashed 3 wheelie bins and created quite a mess. Luckily no one was hurt. The Landlord is having to pay for the urgent clean up to make things safe and has informed us they will probably be claiming on their insurance to cover the costs. Do you have landlords insurance in place for your rented property?